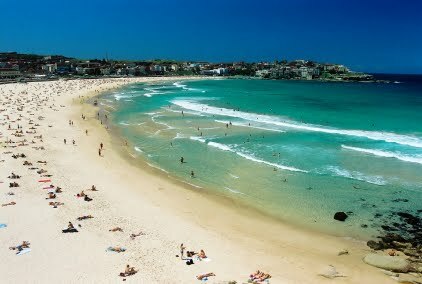 Australia trip is incomplete without a visit to Bondi beach.Bondi Beach is one of the Australia's most famous beach. It is about one kilometre long. It is situated in Sydney’s Eastern suburbs, in New South Wales on the East coast of Australia.The beach is divided into yellow and red flags for swimmers.It is one of the main tourist spot of Australia. It is a sandy beach and very popular among tourists. Bondi Beach is the third most visited site in Sydney after the Opera House and the Harbour Bridge. Bondi Beach was added to the Australian National Heritage list in 2008. Bondi Beach is one of the best places for scuba diving. 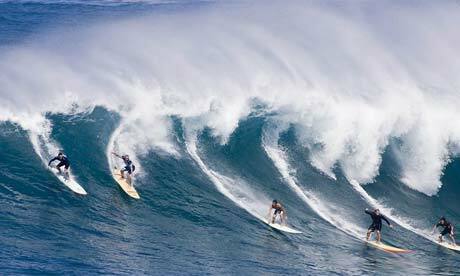 It is a series of steep cliff walls, which run along one of the best spots for scuba diving in Australia. 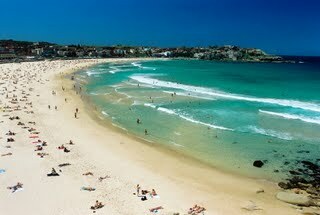 Bondi Beach is also well known area for surfing due to its waves.Generally surfi ng is done on the southern end of the beach. You should visit Bondi during the annual City of Surf Fun Run when thousands of runners reach to Bondi Beach. It is the most crowded event took place here and a large number of visitors come here to enjoy this amazing event.It is also a popular place amongst runners, skaters and cyclists. The beach is also a stunning place to walk during summer. Bondi has an relaxed atmosphere and ideal location for surfing. The water of the beach is so clear. The beach is moon shaped bay full of white sands which adds more to its beauty. Bondi beach is one of the safest beach for swimming in Australia.The beach is delimited by the red and yellow ‘flags’.Swimmers should stay between those flags so they can be watched by the lifeguards.They provide full safety to the visitors. In Bondi beach you can also find a park, beach volley courts etc. Bondi hosts many events and Festivals throughout the year. Some of them are Kite flying Festival, Sculptures by the Sea, End point of the City to Surf fun run and many more. So visiting during festival time you could understand the culture,people and festivals of Australia. This is the busiest time of the year. It is also home of the famous Bondi Icebergs swimming club where some swimmers, swim in the chilly Bondi Baths on winter Sundays. It is a different experience for those who haven`t done it before. The best way to reach bondi beach is through buses which you can easily get at a regular interval of 10 minutes.There are many seafood restaurants,cafes and clubs on the way to Bondi junction. So,Bondi is not only a beach but also a place of surfing,scuba-diving,beach of festivals and events,way full of restaurants,bars,clubs,a nice beach for experience sun and bath. Bondi offers many budget trip holidays.No one should miss it.